The information presented in this section is to assist NRCS field staff in developing and using conservation benefit indicators to rank and compare environmental investments. The section does not provide specific sets of indicators, nor does it recommend specific site or project ranking criteria. It does describe criteria that should be used to compare alternatives and shows how differences in site and landscape characteristics can be used to develop indicators related to those criteria. In this section a farm site is treated as a natural resource system that generates a mix of environmental services in addition to providing agricultural products. We recommend that it be used as a tutorial that provides a basis for understanding various methods that are being proposed for assessing relative ecosystem values. We welcome feedback about the information provided here and about information that is not here, but should be. Making decisions about conservation spending requires information about FACTS and VALUES. Those who control federal and regional environmental spending (e.g., green payments) have access to three sources of information about FACTS and VALUES. Scientists provide them with as much "value-free" FACTS as possible. Interest groups bombard them them with their spin on VALUES. Objective benefit estimation of the type described here provides them with a source of unbiased information about VALUES. As difficult and controversial as value-based research is, it is the only objective source of information that policymakers have about VALUES. Often it is the only credible basis for opposing the special interest spin on VALUES, and the only way to discourage wasteful environmental investments or ones that are not in the public interest. The following diagram shows the Big Picture. 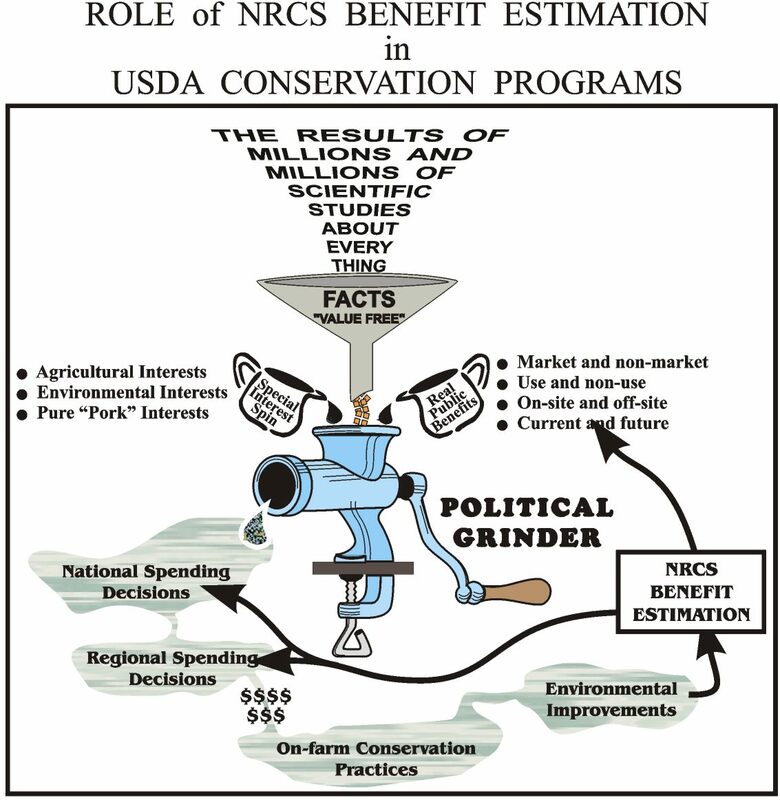 It depicts NRCS benefit estimation as an essential supplement to scientific research about FACTS, and a useful countervailing force to special interest spin about VALUES. The following chart provides an overview of where NRCS Conservation Benefit estimates fit into The Big Picture. It shows environmental policies and conservation spending decisions resulting from political decisions that are based on three sources of information: Assessments of Facts provided by scientist, biased assessments of Values provided by Special Interests, and objective assessments of Values provided by NRCS. Objective assessments of ecosystem values provided by NRCS provide an important supplement to scientific determinations about Facts and an important check on special interest spin about Values. spin influences what people think is "valuable"
also influences perceptions of "value"
all goes through . . .
which chews up facts, special interest spin, and objective benefit estimation and spits out.....policy. Which of the nine alternative spending decisions will provide the greatest environmental benefits? The indicators outlined in this section will help answer this question. Clues as to how relative value indicators can be developed and improve spending decisions are provided in Figure 2 which puts the Sites shown in Figure 1 in their respective landscape contexts. A site's landscape context, quite apart from the onsite characteristics that may be the focus of a conservation project, has significant impact on the values provided by the site and the benefits of an onsite project. And landscape context does not only include the proximity of the site to other natural features of the landscape, such as water bodies and wildlife habitats. It includes its proximity to man-made features of the landscape, to people, and to problems caused by people. The approach to indicator development outlined in subsequent sections treats a farm as a resource system that provides a mix of valuable ecosystem services as well as a mix of valuable agricultural products. The landscape context of the farm site, in its broadest sense, includes the many factors that determine the mix of ecosystem functions and services it provides, who has access to them, how scarce they are, how useful they are, how replaceable they are, and so on. In conventional economics these would be called "leading indicators" of ecosystem values. In the context of the choices depicted in Figures 1 and 2 they reflect the expected environmental payoffs from environmental investment alternatives. A description of landscape differences that reflect the relative benefits from investing in each of the nine conservation alternatives is provided in the Illustration section under Illustration # 1: Conservation Alternatives. To further illustrate the basis of the indicators described in this section consider a slightly different situation. 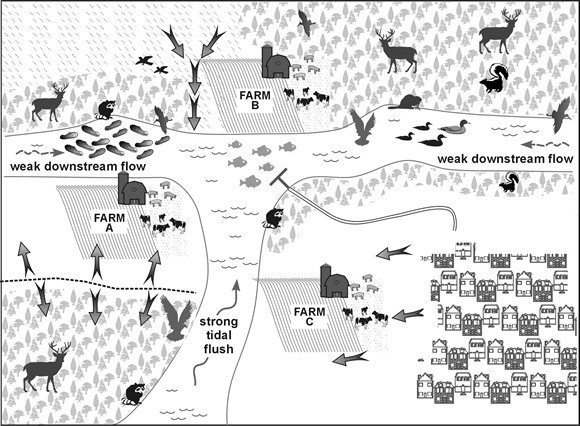 Assume that you are asked to conserve or restore one of the two wetland areas depicted in Figure 3 below. The two wetland sites are shown to be identical in size and shape. For purposes of illustration assume that they are also identical in terms of all biophysical characteristics, including soil, hydrology, and vegetative cover. Based on site conditions alone, therefore, the benefits from investing at both wetland sites would appear to be identical. However, here again, differences in the landscape contexts of the two wetland sites provide many "leading indicators" that investing in the wetland at Site A would yield far more benefits than investing in the wetland at Site B. The bullet points listed below the graph point out some important difference between the two wetland sites that can be expected to affect their relative "values." The challenge of developing relative value indicators in this case, as in the previous depiction of nine competing conservation investment alternatives, is to quantify differences in landscape factors that can be expected to to enhance or inhibit the expected flow of benefits. 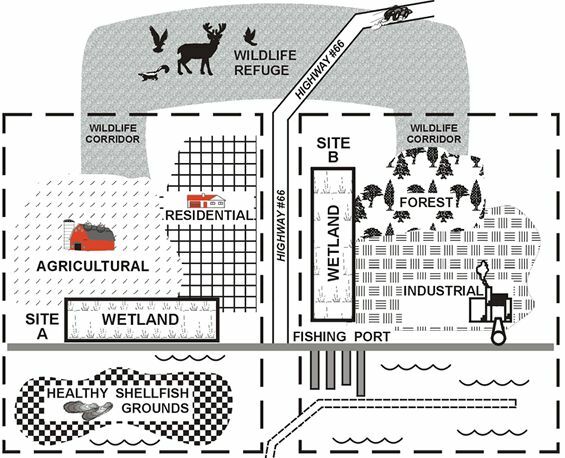 An assessment of the differences in expected value of the wetland at Site A and at Site B and the development of some illustrative indicators are included in the Illustrations section under Illustration # 2 wetland trading. Investing in the environment (Natural Capital) in many ways is similar to investing in children (Human capital) or highways (Manufactured Capital). Each type of investment generates public benefits in many "roundabout" ways that are difficult to trace and measure. 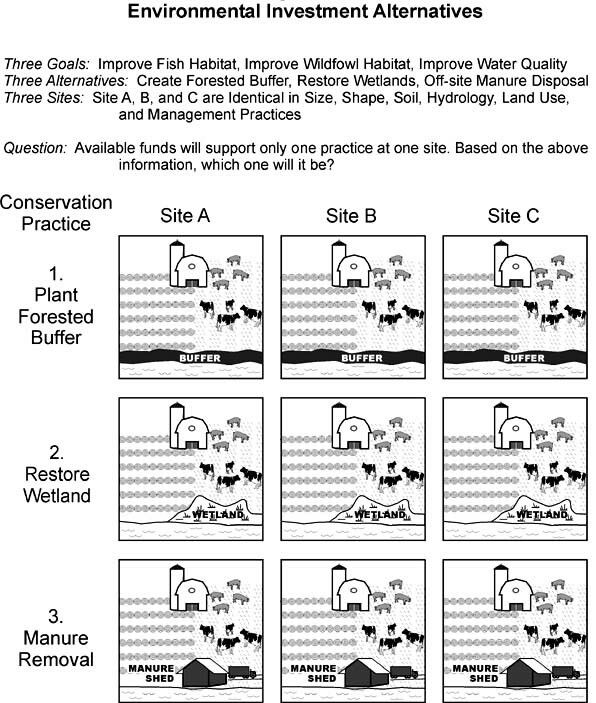 For example, investments that reduce nutrient deliveries to nearby water bodies may, under certain landscape conditions, result in more Algae and more Submerged Aquatic Vegetation (SAV) and, depending on other landscape factors, may generate pathways of benefits as depicted in Figure 6. Measuring the effects of specific investments on each potential pathway of benefits (e.g., improved fish habitat), or tracing any "after-the-fact " measure of ecosystem value (e.g., better fishing) to a specific investment may be difficult or impossible. However, it is possible to use "leading indicators" to determine the likelihood that a specific investment will contribute to the building blocks of ecosystem benefits. Understanding these building blocks provides a basis for designing useful indicators for managing environmental investments. In this regard making smart investments in in the environment is very much like making smart investments in good schools or efficient highway systems. "After-the fact" measures of benefits that may take years to appear and may accrue many miles away are not very useful for assessing or comparing investments in schools, highways, or environmental resources. These investment decisions need to be based on "leading" indicators of what is likely to succeed or fail . The indicators developed in subsequent sections focus on how the landscape context of a site determine what building blocks of ecosystem value are present and, therefore, how changing conditions at a site through a conservation practice is likely to generate ecosystem values. adjustment to the expected level and value of services to account for the vulnerability of onsite and offsite inputs to natural and man-made stresses that could disrupt future service flows. The logic behind the types of relative indicators developed in this section is based on the following four hypotheses. Each can be tested for a particular region or conservation district to determine if the indicators provide useful distinctions for assessing and comparing environmental investments. #1 The landscape context of an ecosystem or farm site includes its proximity to natural features (e.g., water bodies, shellfish beds, floodplains), to man-made features (e.g., roads, drainage ditches), to people (e.g., cost of access, availability of substitutes), and to problems caused by people (e.g., endangered species, nutrient runoff, siltation). Generally available data related to landscape context provide information to develop leading indicators of the relative economic value of ecosystem services provided at different sites. #2 Natural, man-made, topographic, and demographic features of the landscape are not uniformly distributed across most watersheds. As a result there will be meaningful differences in landscape indicators that will provide a basis for comparing environmental investments and trades on the basis of expected ecosystem services and their relative values. #3 Demand indicators based on individual and community preferences for specific ecosystem services (expressed, revealed or imputed) can be combined with Supply indicators based on the abundance, availability, and vulnerability, and substitutability of specific ecosystem services to provide a reliable basis for assigning relative weights to ecosystem services. The weighted sum of service values for different ecosystem types and ecosystem areas provides a meaningful basis for making value-based comparisons. #4 Differences in the supply and demand for services provided by ecosystems in various landscape contexts and in the relative weights assigned to those services provide a practical and scientifically defensible basis for ranking the expected economic payoffs from ecosystem improvements. These can provide a basis for developing ranking criteria to guide spending on USDA conservation programs to those projects and areas where they will have the greatest environmental and economic benefits. Resources to support indicator development include topographical maps, soil maps, land use maps, natural resource and habitat maps, and demographic and socioeconomic data. With some upfront investments in GIS applications the benefit indicators related to specific environmental services could be accessed merely by providing the zip code or lat./long. coordinates of the site. Regional surveys of Outdoor Recreation: participation rates, willingness to pay, etc. Regional surveys of Preferences for Environmental Amenities. Click for a Checklist of data resources.